‘This Side of Paradise’ by Fremdkunst was released on label-sampler ‘Fremdtunes – the series 2‘ and ‘Zauberschwein im krankenhaus‘. Fremdkunst is a project initiated by DJ Mace in 2004 and this track also features DJ Optimus (additional keys) and Shycop (guitar, trumpet). Mace, besides DJ-ing and producing, runs Fremdtunes with partner in crime Neels Smeekens, and has been making noise in the field of music since the early 90’s. As Fremdkunst, he will release a new EP very soon. 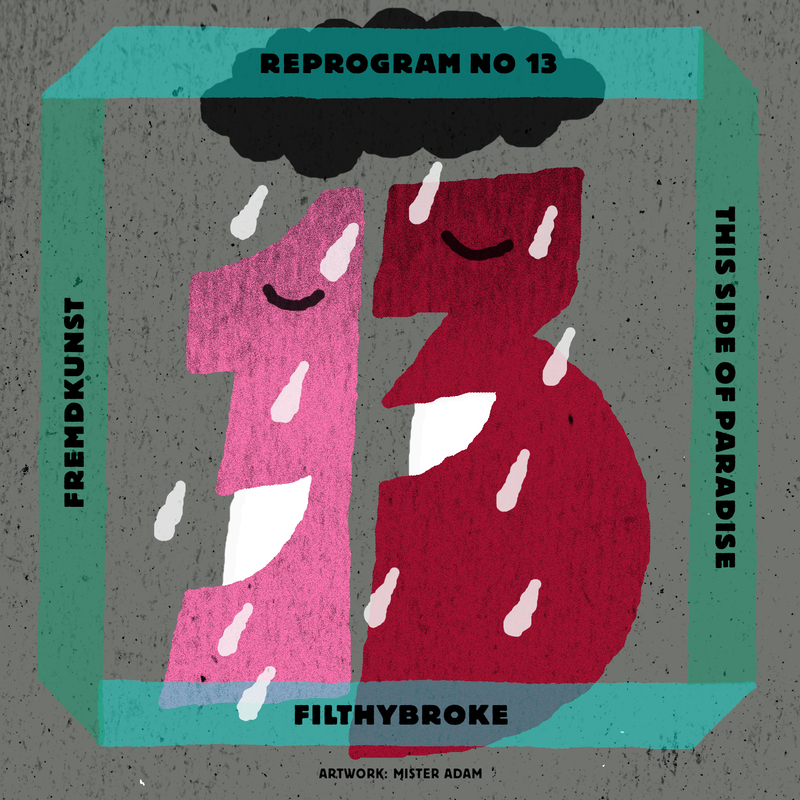 FilthyBroke remixed ‘This Side of Paradise’. He slowed down the pace, added vocals, percussion, synths, reverberating drums and created a haunting track that breathes everything that makes Filthy’s world so interesting. FilthyBroke is the new project from old producer Michael J Collins (AZ, USA). MJC had built a solid reputation releasing/ licensing futuristic and quirky disco with imprints such as Wolf+Lamb, Fabric, K7 etc. He then inexplicably stopped producing music for nearly two years. He’s now at it again, releasing music through his newborn label FilthyBroke Recordings and ready to rock steady. This year he released the free ‘SketchyBook‘ through Fremdtunes. The remix is mastered by Collin Visser. This is the second piece of art for Reprogram by Mister Adam. Mister Adam is an Amsterdam based typographic designer, co-founder of a multidisciplinary collaboration project called Mashville and teacher at ArtEZ Institute of the Arts. Besides curating the artwork for Reprogram he’s the steady engine behind most of the graphic design for Fremdtunes.